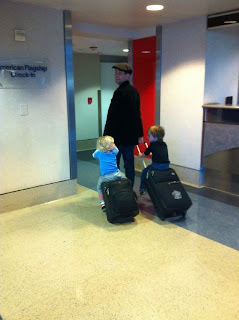 Here is a photo Joey shared of him and his sons at the airport heading to Boston. New Kids On The Block star Joey Mcintyre has teamed up with his big sister to record a track on his new holiday album. The singer used to perform with his sibling, Carol, when he was a kid and she was the first person he asked to join him in the studio while recording festive tunes for Come Home For Christmas. The McIntyres, who share the same New Year's Eve birthday 10 years apart, collaborated on festive standard Do You Hear What I Hear? The pop star says, "It was very special to sing with my sister. I would not have been where I am in my career without her first holding my hand and leading me on stage. It made performing a very safe and natural experience. And now the stage is home to me. "I have to say we sound great together on Do You Hear What I Hear?"